Poet, editor, organizer and founder of the literary platform I.D.I.O.T. Tibor Hrs Pandur from Slovenia talks about the importance of independent publishing. Yet it is only through festivals, music and performance literature that can be enhanced and spread according to contemporary needs. That also touches the politics of literature. And this is also what Tibor writes about. Make the intimate things the agenda and mask them by text. JS: Thank you for being here with me, Tibor. I would like to start out with a question that I like to hear your opinion about. What do you have in mind when you hear the term “literary activist”? Tibor Hrs Pandur: An activist is literally someone who puts his body or life on the line through speech and action. If I speak in a dictatorship of the regimes crimes it creates the possibility of a proportional backlash of negative retribution. Is not to risk lives for ideas (or at least our reputations), for the things we believe in or believe to be true perhaps the greatest thrill or drug of man? And a necessary drug at that? Art needs to be a risky business with clear impact and resonance of the receivers. If art is not subversive, if it does not subvert society or language or politics at large, it is impotent. If it doesn’t shock the receiver, becoming a memory for the future actions of a reader, it is futile. Of course we are in Europe faced with (as Hakim Bey said) “a prison without walls”, where you are permitted to say anything, since it has almost no immediate or apparent impact on a wider scale. A literary activist is probably someone deeply engaged in the production of literature on all levels: editing, writing, publishing, translating or disseminating. Each generation needs to acquire the freedom to publish whatever it wants and create platforms to do so. We as humans are literary machines, the text is an intelligent machine, a feedback carrier for human development and interaction. As I write I programme or design the architecture of a shared and common experience, downloadable, enhancable, developable by all, the end result of which we never get to truly know. And if you don’t know the consequences of your actions, how can you know anything? To communicate is to gamble. Is literary activism also about being a rebel? I am wondering what you think, is there a reformative quality to the term? More like being or trying at least to be autonomous on as many levels as possible, to not just be a slave of your own opposition. If that is possible at all. A writer usually starts out as an outsider. Someone who through language communicates or translates complex electrical impulses of the clash between his internal organs and the outside world. Who makes the unseen visible, or gives voice to the voiceless. The distribution of sense or the perceivable (“le partage du sensible”) according to Rancière is the politics of literature. To make your intimate experiences public and mask them with the medium of your choice . CRY OUT FOR CROWD is a series produced to show the variety of literary activists across Europe from different regions and cultures. Being a literary activist can mean a lot of things from being a translator, an editor, a publisher and/or an author but also an organizer or even a programmer. It aims at introducing new forms of disseminating literature so if you have anything to add or anything you want to say please write to CROWD. If you like the idea you can easily join CROWD. Let’s spread the wor(l)ds. We want CROWD to be the literary idea of many. However, there is just one guideline; CROWD wants to support new ways of disseminating literature. So may I ask: What interests you in CROWD as a pan-European literary platform and what could you imagine for the project? I think we all recognize the need for a wide network of authors, publishers, translators and critics, in order to exchange or share literature as we know it, and to also create spaces where this is possible. We need to focus on creating publishing platforms, which give us the autonomy to freely publish, discuss and translate whatever we desire. We need to create platforms through the collaboration of IT professionals and literary producers and connect the cognitariat with the proletteriat. We need to connect already existing communities of readers, editors, writers and translators, enabling us to acquire all the necessary means of literary production. The power to create words is the power to create worlds. We recently started an international festival of developing literary practices called LITERODROM which was focused on Ex-Yugoslavia in January 2015. We tried to map the conditions of production, as well as the production and reception of young and independent authors and editors in the region. To consider literature in all its aspects of production through discussions, readings and music. How did the festival turn out to be? It went great. Next year our geopoetical focus will be the German speaking world and also immigrant literature, so the “Northern Balkans” in a way. Do you think that traditional forms of presenting literature are necessarily connected to old forms of publishing literature? Do new forms not have a place in traditional media and publishing platforms? Why not stick to traditional and established structures and try to reform them than do new forms? Because old structures become rigid in time and it’s easier and quicker to start a new magazine or literary portal than try to overtake an established one through years of sucking up to people who exercise power just by controlling established means and networks of literary production, the funding for the maintenance of which is acquired annually in fixed rates from a branch of the Ministry of Culture. At least in Slovenia, it’s like this. Many who started out as editors and authors will be or were forced to become bureaucrats with life-long mandates. A specific problem is the distribution of literary funding in such a system, where certain publishing houses hold a monopoly on publishing, regardless of quality, but just by the historical reputation of its institution or its influence on the distributors. That’s why it’s also hard to survive or force yourself into such a system as a new magazine for example. So the only choice in such a rigid state of affairs is opening up and going transnational and multilingual. Editorial freedom is essential for young authors. We learned from previous generations and tried to do the opposite: foster direct communication between authors and editors, considering the text itself our true focus, regardless of author, quantity, style or poetics. Searching for texts and authors, who express something essential and who don’t compete in finding the cure for insomnia. Every issue of IDIOT magazine presents a cross section, a small anthology of numerous authors writing or translating in this point in time. We always try to present our magazine with music, spoken word performances and a party to finish. There is a great scene here in Ljubljana with Young Rhimes (Mlade rime) who organize readings and concerts with published and unpublished authors of all generations throughout the year. Among your writings there is theoretical writing, translations and you write poetry. What fascinates me is that you write plays, too. In Germany playwrights are somewhat treated as orphans in the literary scenes not belonging to the literary scene and not belonging to the theater. Have you made any similar experience? I grew up in the theatre and consider every live reading as theatre, as a performance of the text and a social occasion which creates the setting for social theatre after the performance is officially over. Regarding playwriting, I wrote a play called “Sen59” (“Dream59”) which deals with dreams. I am fascinated by the structure and the narrative of dreams. The book I am working on now “Internal Affairs”, is also compiled from dream texts. Texts produced right after waking and assembled, so you get a collage of narratives, a sort of hybrid between poetry and prose. This process revealed an interesting thing, while trying to be brutally honest and disclosing your secrets or inner-most desires firstly to yourself by committing them to paper, you realize this constant struggle against self-censorship, this war against forgetting of how your mind or body actually works or processes experience. Of course the act of writing changes the dream, it tries to put into logical order something that is constantly falling apart. But that’s fascinating to me, this struggle to remember or report an internal affair, because it sometimes generates surpluses, opens streams of association, releases or solves something by making it conscious. To try to speak your mind in this way, trying to, also, to write as you speak, means trying to disclose how your mind actually works to yourself, first and foremost, but by this act, it becomes memorable and shareable by all. Isn’t it very personal? Aren’t these dreams very connected to your personal story? Is this not I-me-myself? Yes, of course. But the gamble is to show how the truly personal is actually universal. And do you have a strategy how to handle this? Or some filter? I try to edit each single text as less as possible, but of course your mind structures it somehow afterwards, imposes logic or some kind of order. And you always self-censor, but you get to see what that is. Every piece of writing by constructing the author, discloses the author. Or masks him through disclosure. It’s just levels of how much you mask the text through characters or narrative. When in public people tend to act or lie about their true emotions, but in dreams people rarely lie to themselves. So this method reveals how rarely you are conscious of the movies your mind plays to itself, these narrative constructions of specific circumstances, the histories of decisions, the logic of your emotional reactions, the repeating patterns of conflicts. How your body is the ID, how you’re shaped by bodily functions, forces or desires apparently beyond your control. I found that a lucid revelation of a dream can be more political than trying to solve political problems by noting them down in your notebook. Anyway, a Lacanian theory says that the act of speech always reveals something you didn’t want to reveal in the first place. But why not try to reveal as much as possible? You wrote your master thesis about Ezra Pound who is famous for being a poet but fell for fascism. Could you explain some more, please? That’s his personal tragedy inscribed in his work and part of the story. For a long time the common logic was: if he was a fascist he cannot be a good poet. But then Surette came along and cleared things up. He clearly lost it and fell for all the fascist and anti-Semitic propaganda, but he came to all that from specific radical economic theories, conspiracies and his infatuation with Italian culture. His Cantos bear witness to the great folly of an intellectual blinded by fascist conspiracy theory. As all great epic poems it relates a great war, but here the author goes down along with the oppressors. He was later imprisoned for 13 years in a mental institution in Washington for treason. Anyway, I was interested in the structure of his Cantos as they relate to the internet, because they are unreadable without all other books, which it quotes, so it’s a hypertext before hypertext. A book as a network of all books. The book of books. Tibor Hrs Pandur, was born in 1985 in Maribor, Slovenia, and received his Bachelor’s Degree in Comparative Literature at the Faculty of Arts in Ljubljana with his thesis on Ezra Pound: The Song as Vortex and Hyperlink. He is the founder and editor of the literary magazine and paraliterary organisation I.D.I.O.T. where he publishes poetry, drama and theoretical writings, giving spoken word performances in Slovenia and around Europe. In 2008, his first play Dream 59 (awarded the young dramatist award in 2013), directed by Jana Peršuh, premiered at the Ljubljana Glej Theatre. 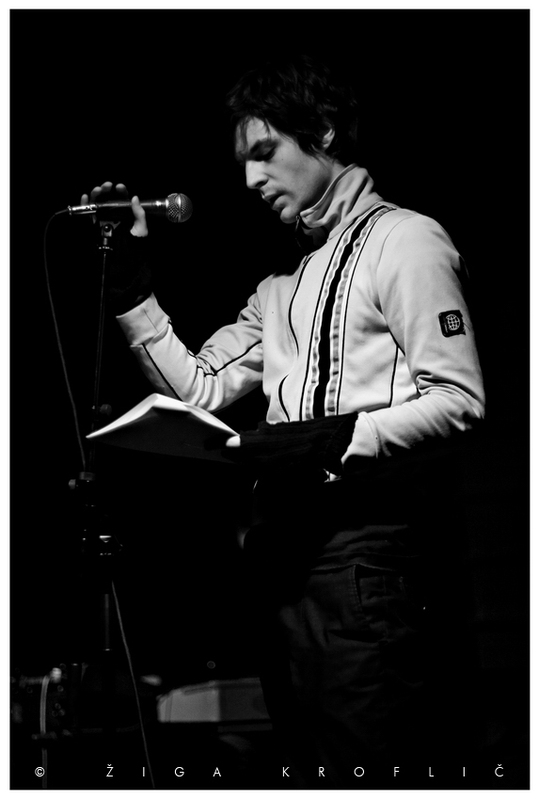 In 2010, The Center for Slovenian Literature published his first book of poetry Energymachine, followed by his translations of Jim Morrison’s selected poetry in 2011. He is also the programme leader (along with Uroš Prah) of the literary festival LITERODROM in Cankarjev dom, Slovenia. Currently he is working on his second book “Internal Affairs”. Previous PostFast │ Cheap │ Dirty: Anneke Brassinga (NL)Next PostIt’s here: The CROWD flyer!